Domesticated dogs usually bark for two reasons, when alarmed or due to a threat. Moreover, some dogs may bark as a response to their owner or out of habit. In either case barking dogs, especially those with a habit of consistent barking can cause an annoyance for the dog owner and others. To prevent a dog from barking, the cause for the dog bark should be removed if it can be identified. If the dog continues to bark different methods can be used for dog debarking. Some are modifications in behavior like training a dog to stop barking and the use of different types of collars. Other methods are the use of various sedative drugs or a surgical cordectomy. Training dogs not to bark; Dogs can be trained to be desensitized against the stimulus of the causes of barking. In this regard a series of commands can be effectively taught. Dogs should be exposed to several stimuli, and then rewarded for remaining calm. The intensity of a stimulus is increased each consecutive day. A three month course of action is considered sufficient for improvement. It should be noted that training for stopping dog barking should only be initiated after thoroughly considering the cause of the dog bark. In many cases like anxiety, deafness, aging, eye sight problems etc. desensitizing is usually not effective. Similarly, some watch dog breeds, if when young in age were trained or rewarded for barking, it may be hard to conduct desensitization. Bark Collars; Other then for training, several “Bark Collars” are used for dog debarking. "Shock Collars" are those which deliver an electric shock of varied sensitivity to the dog, which may be automatic or manual, when the dog barks. In the case of consistent barking, this product usually shuts down to prevent too much shocking. This product is effective but can cause slight pain and irreversible behavioral changes in dogs. Another collar used is called a “Sonic collar”. These collars produce noise or an annoying sound wave for a dog, if it barks consistently. This method is considered not to be that effective. "Citronella Collars" are considered to be the most effective. 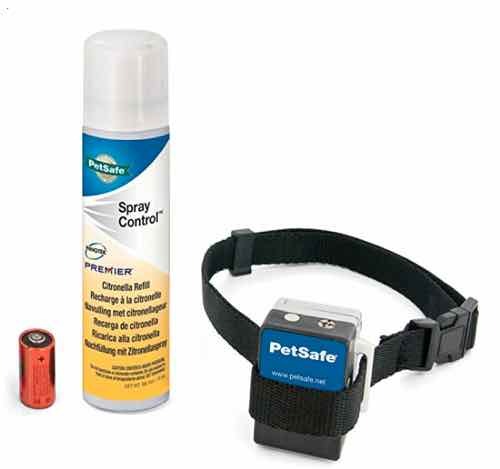 These collars release a citronella squirt after a dog barks. It is a gentle way for canine debarking. Since dogs are more sensitive to smell, the use of this collar intermittently is more effective. Medications; Psychotropic drugs can be used for not only canine debarking but also for several behavioral problems. Use of psychotropic drugs may result into a sluggish dog. Several drugs such as buspirone, clomipramine and amitriptylene etc. can be used for this purpose. There is a homoepathic product available called PetAlive Problem Pet Solution that contains herbs known for having a soothing effect on dogs. It is a natural approach, should not have side effects since it is a natural product, and in dogs that respond, it could be an effective solution. Surgical Debarking; Also called vocal cordectomy or vasticular cordectomy. Cordectomy is a term used for removal of a cord. Surgical canine debarking can be performed by removing the tissues from the sides of the vocal cord or larynx, resulting in a reduced pitch and decreased level of the barking sound. This can be done either by an approach from the mouth or by making an incision at the throat and then removing tissues from the vocal cord. Complete removal is never possible and not recommended and can never ensure complete silencing of the dog. Post surgical care like that of use of pain killers and antibiotic therapy is usually necessary if an incision at the throat is made. There are some problems associated with surgical dog debarking. Upper respiratory tract problems are common in those dogs who undergo vocal cordectomy, due to scar formation at the edge of the voice box or larynx. There are several controversies associated with canine debarking. Several animal rights organizations have termed dog debarking, especially surgical options and use of collars as inhumane. In the UK surgical debarking is prohibited, similarly various states in the US have considered legislation against surgical dog debarking.